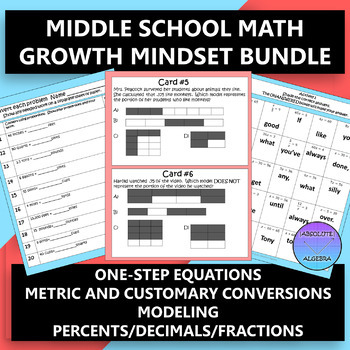 Your middle school students will have fun practicing writing and solving one-step equations, finding metric and customary conversions, and modeling fractions, decimals, and percents while learning how to have a growth mindset! Students will practice the problems and shade out the answers in the grid. The unshaded answers form a growth mindset quote. Students can write about what this quote means and you can dicuss it as a class.